Gamification in libraries has become a topic of interest in the professional discourse, and one that ACRL TechConnect has covered in Applying Game Dynamics to Library Services and Why Gamify and What to Avoid in Gamification. Much of what has been written about badging systems in libraries pertains to gamifying library services. However, being an Instructional Services Librarian, I have been interested in tying gamification to library instruction. When library skills are not always part of required learning outcomes or directly associated with particular classes, thinking more creatively about promotion and embeddedness of library tutorials prompted me to become interested in tying a badging system to the University of Arizona Libraries’ online learning objects. 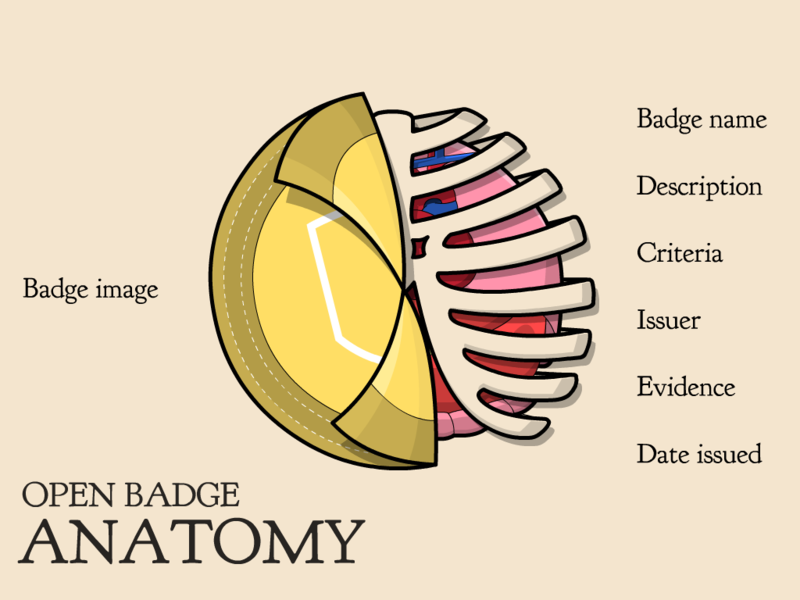 For a brief review on badges, they are visual representations of skills and achievements. They can be used with or instead of grades depending on the scenario and include details to support their credibility (criteria, issuer, evidence, currency). Becoming a beta tester for Purdue’s Passport platform gives me the opportunity to better sketch out what our plans are and to test how gamification could work in this context. Passport, according to Purdue, is “A learning system that demonstrates academic achievement through customizable badges.” Through this platform, instructors can design instruction for badges to be associated with learning outcomes. Currently, Passport can only be used by applying to be a beta tester. As they improve the software, it should be available to more people and have greater integration (it currently connects with Mozilla Open Backpack and within the Purdue system).We are still comparing platforms and possibilities for the University of Arizona Libraries, and testing Passport has been the first step in figuring out what we want, what is available, and how we would like to design this form of instruction. I will share my impression of Passport and using badging technology for these purposes from my experience using the software. It’s important to understand how motivation works in relation to a points and badges system, while also having a clear goal in mind. I recently wrote a literature review on motivation in gamified learning scenarios as part of my work toward a second Master’s in Educational Technology. The general ideas to take away are the importance of employing game mechanics thoughtfully into your framework to avoid users’ relying solely on the scoring system, as well as focusing on the engagement aspects of gamification rather than using badges and points just for manipulation. Points should be used as a feedback mechanism rather than just promoting them as items to harvest. Putting this into perspective for gamifying library instruction at the University of Arizona, we want to be sure student motivation is directed at developing research skills that can be visually demonstrated to instructors and future employers through badges, with points serving as feedback and further motivation. We are using the ACRL Information Literacy Standards as an outline for the badges we create; the Standards are not perfect, but they serve well as a map for conceptualizing research skills and are a way we can organize the content. Within each skill set or badge, activities for completion are multidimensional: students must engage in a variety of tasks, such as doing a tutorial, reading a related article or news story, and completing a quiz. We plan to allow for risk taking and failure — important aspects of game design — so students can re-try the material until they understand it (Gee, 2007). As you can see in this screen capture, the badges corresponding to the ACRL Standards include: Research Initiator (Standard 1), Research Assailant (Standard 2), Research Investigator (Standard 3), and Research Warrior (Standard 4). As a note, I have not yet created a badge for Standard 5 or one to correspond with our orientations (also, all names you can see in any image I include are of my colleagues trying out the badges, and not of students). A great aspect of this platform is the ability to design your own badges with their WYSIWYG editor. Because a major issue for us is scalability with limited FTE, we have to be cautious in which assessment methods we choose for approving badges. Since we would have a hard time offering meaningful, individualized feedback for every student who would complete these tasks, having something automatic is more ideal. Passport allows options for students to test their skills, with multiple-choice quizzes, uploading a document, and entering text. For our purposes, using multiple-choice quizzes with predetermined responses is currently the best method. If we develop specific badges for smaller courses on a case-by-case basis, it might be possible to accept written responses and more detailed work, but in trying to roll this out to campus-at-large, automated scoring is necessary. Within each badge, also referred to as a challenge, there are tasks to complete. Finishing these tasks adds up to earning the badge. It’s essentially leveling up (which is progressing to the next level based on achievement); although the way Passport is designed, the students can complete the tasks in any order. Within the suite of badges, I have reinforced information and skills throughout so students must use previous skills learned for future success. 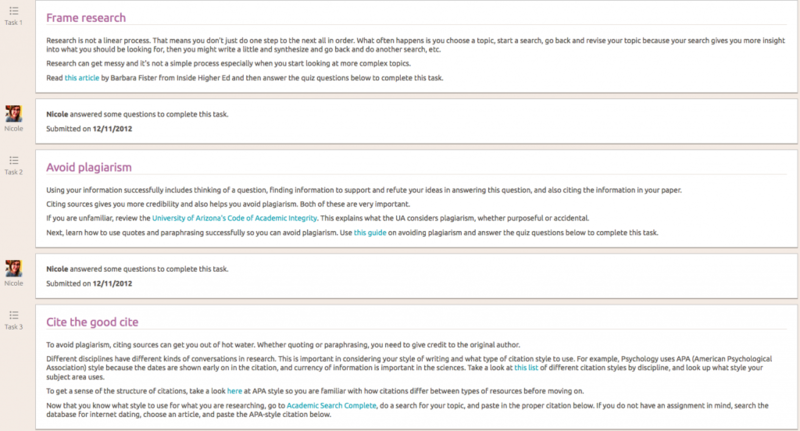 In this screen capture, you can see the overall layout by task title. 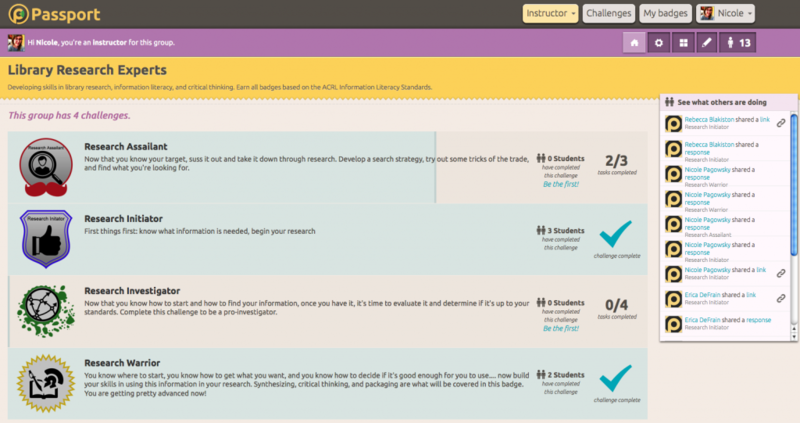 When including tasks that require instructor approval (if students were to submit documents or write text), an instructor would click on each yellow box stating that approval is needed to determine if the student successfully completed the task and supply personalized feedback (image above). And you can see the breakdown of tasks under each challenge to review what was learned; this can serve as confirmation for outside parties of what kind of work each badge entailed (image below). Passport “classrooms” are closed and require a log in for earning badges (FERPA), but if students agree to connectivity with Mozilla’s Open Badges Backpack, achievements can then be shared with Twitter, Facebook, LinkedIn, and other networks. Badges can also connect with e-portfolios and resumes (since it’s in Beta this functionality works best with Purdue platforms). This could be a great, additional motivator for students in helping them get jobs. From Project Information Literacy, we do know employers find new graduates are lacking research skills, so being able to present these skills as fulfilled to future employers can be useful for soon-to-be and recent graduates. The badges link back to more information, as mentioned, and employers can get more detail. Students can even make their submitted work publicly available so employers, instructors, and peers can see their efforts. Whether or not it is possible to integrate Passport fully into our library website for students to access, using this tool has at least given me a way to essentially sketch out how our badging system will work. We can also try some user testing with students on these tasks to gauge motivation and instructional effectiveness. Having this system become campus-wide in collaboration with other units and departments would also aid in creating more meaning behind the badges; but in the meantime, tying this smaller scale layout to specific class instruction or non-disciplinary collaborations will be very useful. Although some sources say gamification will be taking a huge nosedive by 2014 due to poor design and over-saturation, keeping tabs on other platforms available and how to best incorporate this technology into library instruction is where I will be looking this semester and beyond as we work on plans for rolling out a full badging system within the next couple of years. Making learning more experiential and creating choose-your-own adventure scenarios are effective in giving students ownership over their education. Using points and badges for manipulating users is certainly detrimental and should fall out of use in the near future, but using this framework in a positive manner for motivation and to support student learning can have beneficial effects for students, campus, and the library. Dignan, A. (2012). Game Frame. New York: The Free Press.